How Much Does A Postal Money Order Cost? There are many factors which determine the cost of a postal money order. The amount for which the money order is purchased will have a direct impact on the amount of money that a person needs to spend in order to purchase this universally-accepted method of payment. Currently, money orders which cost $500 or less will cost $1.25. Money orders which are for $501 to $1000 will cost $1.65. This does not include insurance or tracking on the item itself. A military issued money order will only cost 35¢. This is advantageous to military families who are constantly moving and need to be able to provide a secure payment method for their needs. 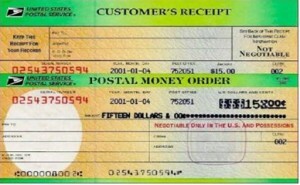 A money order is often good for up to one year after the original purchase. The carbon copy is also beneficial for people who want to have proof that they made the purchase. People also need to keep in mind that a money order which is purchased for international goods and services may often cost more for customers to utilize. These types of purchases are beneficial for individuals who do not have access to paying for their goods and services online. Individuals who are serious about protecting themselves from potential fraud will be able to make a secure purchase with a money order. If an individual chooses to purchase tracking for their money order they often can have it replaced. This only takes filling out a little bit of paperwork regarding the number on the money order and the intended recipients. Tracking is usually under $1.00 for most money orders and is a worthwhile investment for individuals who are doing online shopping. Depending on the size of the postal service providing the money order, it can take approximately 1 to 4 weeks to get a claim processed. If the transaction has taken place internationally sometimes it takes a little bit longer for all the paperwork to be properly handled. This is helpful for individuals who were trying to recover their money without having to invest in a hefty legal battle. Identifying the exact whereabouts of the money order may not be possible, but that doesn’t matter, because getting money returned is the real goal for most people who have filled out the proper paperwork to purchase insurance and tracking on the piece of mail containing the money order. A postal employee can help you figure out the right forms to fill out for these purposes. If a money order is in any way damaged an individual can take it to the local post office to have it replaced properly. This means that an individual does not have to worry about damage in the mail system causing them any financial hardship. Understanding how to have a money order processed is simple, and great for people who do not want to have to go through the process of setting up or using an online payment system. Unlike a check, a money order is in no danger of bouncing, because the cash has already been paid. That helps ensure the legitimacy of the money order for anyone who is concerned about whether the payment method is safe. The ability not to give an actual name on the money were also allows people to protect their identity as they suspect someone could do them any harm. Having an anonymous way to make payments is helpful for individuals who are serious about protecting their personal identity. A postal money order is almost the same as a cash transaction — just without the danger of the cash getting lost in the mail — and is supported by the postal service as a preferred payment method for safety reasons. For the little bit of cash that it costs to purchase a money order at the post office, you get a lot of peace of mind. Hi Don! Some eBay sellers still allow payment via money order, as do some small online businesses — you just have to contact them before placing your order. They might have to process your order manually instead of via their online shopping cart, but small business owners (online or offline) are going to be more willing to work with you than a larger business would. However, if you develop a Paypal-like business model that allows you to fund your account with money orders, that would be all the better! 🙂 Good luck!